Sometimes movies are unfairly unsympathetic to people In Charge. If you’ve ever been In Charge of something, you know what we mean. You’re working on a big project with an impossible deadline, when a crucial team member announces they’ve Met Someone and are moving away. It really takes the air out of your tires. 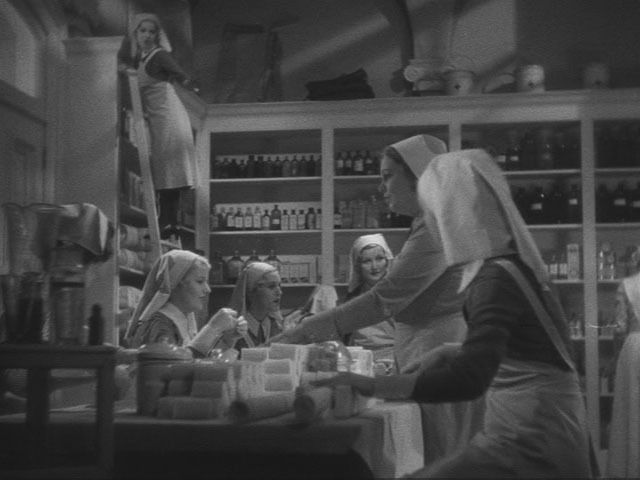 So when we watched the WWI drama A Farewell to Arms (1932), our sympathies were with Blanche Friderici, the actress who plays the head nurse of an Italian hospital. Friderici, who died the year after this film was released, is superb as the humourless, pursed-lip nurse who is forever giving speeches about “disgracing” the Nurse’s Uniform. She’s in charge of nursing volunteers: young, unmarried women, many of whom are away from home for the first time and don’t necessarily have formal nursing training. Friderici’s character is disliked and feared, and for good reason. If a nurse ends up “in trouble”, Friderici must dismiss the girl. It’s her job to enforce the Regulations. A Farewell to Arms is the first of three Ernest Hemingway novels to be adapted to screen, and this one was adapted twice. Hemingway reportedly disliked the 1932 version, but he didn’t prevent Hollywood from having another go at it in 1957. 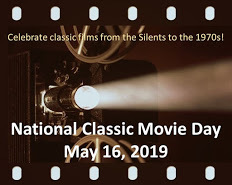 The film is about an English nursing volunteer (Helen Hayes) and an American ambulance driver (Gary Cooper) who meet and fall in love in Italy during WWI. They are introduced through Cooper’s Italian friend (the scene-stealing Adolphe Menjou). Cooper takes Hayes for a walk to a bombed-out church, where he tries to kiss her. She slaps him in a what-kind-of-a-girl-do-you-think-I-am way, but then changes her mind (because who wouldn’t). She invites him to kiss her, and he obliges, politely, but then kisses her again, hungrily. This kiss leads to all sorts of things – a personnel transfer, an injury, and an unexpected pregnancy. You could say it’s the Kiss Of Doom. We (as in, yours truly) can’t decide if we like A Farewell to Arms. Hayes is charming as the idealistic young Englishwoman, and Menjou infuses his scenes with much-needed energy. Director Frank Borzage’s artful images are moving. His war montage nearly takes your breath away, and he laces scenes with sounds of dropping bombs, which unnerve us more than his characters. Still, we wonder about our gal, the head nurse, the Nursing Uniform’s last line of defence. She offers a glimpse of how difficult it must have been to train and protect young women in this war. When Hayes becomes pregnant, she quits nursing to go to Switzerland, sparing Friderici the trouble of firing her. Then Cooper bolts from Italy to follow Hayes. Meanwhile, the wounded pile up. One can imagine Friderici being pulled into a Meeting and being asked some pointed questions. How come she’s not faster at getting men back in the trenches, and why is she requesting new personnel again, and why can’t she keep those blasted girls in check? No wonder Friderici’s character has a stern, disapproving countenance. A lesser mortal would be staggering around hospital corridors in a drunken fog. You’ll have to see the film to decide for yourself. Many say A Farewell to Arms is one of the most romantic pre-code movies ever made. If you love a desperate romance in troubled times, this may be the film for you. For a kinder, more literary review of A Farewell to Arms, see Girls Do Film HERE. For the 1932 New York Times review, click HERE. You can read more about nurses in WWI HERE. A Farewell to Arms: starring Gary Cooper, Helen Hayes, Adolphe Menjou. Directed by Frank Borzage. Written by Benjamin Glazer & Oliver H.P. Garrett. Paramount Productions Inc., 1932, B&W, 80 mins. This post is part of the A Kiss is Just a Kiss Blogathon hosted by Second Sight Cinema. Click HERE to see all the fab entries. Next #MovieScientist Blogathon Starts Friday! I just saw this for the first time a few weeks ago. It’s a gorgeous film if you can find a quality print. (There is a free version on YouTube, but the quality ain’t great.) I hope you’ll like our gal the head nurse, but her role is a small and thankless one. I thought you raised some excellent points! I’m not a fan either, though, frankly, I don’t care for the remakes either. So, perhaps, I should blame Hemingway. Yes, I love Hemingway’s writing, but I’m not a fan of this story. (I’m a cynic, I guess.) I haven’t seen the 1957 version – saving it for another day. I’m with you, Try as I might, I can’t like too much a bout this film (no fault of anyone involved), Women had a rough time, and Hemingway sure didn’t see fit to throw some rope to the drowning. Loved your post, though, and – hey – a kiss from Gary Cooper can’t be a bad thing! You’re right about Gary Cooper! This film has a great cast and it’s beautifully filmed, but ultimately it’s not my cup o’ tea. Thanks! It would be interesting to hear your perspective on this film as a photographer. Well, this is another film that I haven’t seen, Ruth. If and when I do, it will be to see Helen Hayes relatively early in her career. Love her but now I want to see Ms. Friderici, too. Sounds like she would have made an interesting Nurse Ratched in another life. Ha ha! Yes, Ms Friderici would have made a FABULOUS Nurse Ratched. Our gal Friderici doesn’t have many scenes in this film, which is too bad. However, the beautiful cinematography makes up for it. You’ve got me thinking a different way here. Why, if only the Head Nurse could’ve gotten some “lip action” she might have been more sympathetic to the temptations her nurses faced. I guess someone has to watch the chicken coop and keep out the wolves.After all…this is WAR! Nice write-up. Haha! I suspect you may be right! What a fun theme to write about. I love your line, “but then she changes her mind because who wouldn’t!”, regarding Gary Cooper kissing Helen Hayes. Made me chuckle out loud. He would be very hard to resist! 🙂 It was great seeing the pictures of Helen Hayes early in her career. Thanks for the interesting review and heads up about the movie, Ruth! I’m not sure I would drop everything to see this movie, but it is beautifully filmed. Hayes and Cooper are certainly a handsome couple! I must confess I didn’t pay much attention to the head nurse, but you make a good poiont: it must have been a tough job! Your (awesome) review also reminds me that I should re-watch this version and, hopefully, read the book once and for all. I agree that this story isn’t one of my favorites but I do like the title.